* Annual estimated passenger usage based on sales of tickets in stated financial year(s) which end or originate at Charlbury from Office of Rail and Road statistics. Methodology may vary year on year. 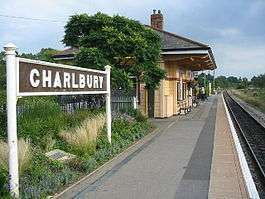 Charlbury railway station is a railway station serving the town of Charlbury in Oxfordshire, England. This station and all trains serving it are operated by Great Western Railway. After almost 40 years as a single-platform station, the track through Charlbury station was redoubled with the recommissioning of a second platform on 6 June 2011 as part of the project to improve reliability and increase traffic capacity on the Cotswold Line. The Oxford, Worcester and Wolverhampton Railway opened the station in 1853. It is notable for the original station building, a wooden chalet-type structure in the Italianate architectural style of Isambard Kingdom Brunel; together with the early station nameboard this is a Grade II listed building restored in 1979. Until 1970 the station had a goods shed, a 30 cwt crane and a 34-lever signal box. The signal box was demolished when the line through the station was singled on 29 November 1971. Sir Peter Parker (1924–2002), the former Chairman of the British Railways Board, was a regular user of the station. With the completion of the first stage of the redoubling of the Cotswold Line from Ascott-under-Wychwood to a point east of Charlbury the second platform, decommissioned in 1971, was reinstated and returned to service on 6 June 2011. ↑ Biddle, Gordon; Nock, O.S. (1983). The Railway Heritage of Britain. London: Michael Joseph. ISBN 0-7181-2355-7. ↑ Leigh, Chris (1981). GWR Country Stations. Shepperton: Ian Allan. ISBN 0-7110-1108-7. 1 2 Stretton, John (2006). British Railways Past and Present: Oxfordshire; A Second Selection (No. 55). Kettering: Past & Present Publishing Ltd. p. 33. ISBN 978-1-85895-203-1. ↑ "Charlbury redoubling complete". Modern Railways. Ian Allan. 68 (754): 18. July 2011. Wikimedia Commons has media related to Charlbury railway station. Historic England. "Details from image database (254141)". Images of England.